Talking to the 93-year-old grand dame of the historic Dooky Chase restaurant offers a glimpse into what New Orleans cuisine is all about. Maybe you know chef Leah Chase because of her cameo appearance in Beyoncé​’s “Lemonade,” in which the the silver-haired Creole matriarch looks dignified in a throne-like chair and stares deeply into the camera. Maybe you heard her name announced last spring, when the James Beard Foundation conferred its Lifetime Achievement Award on her. It’s good if you did find Ms. Chase on one of those highly visible platforms, because you’re not going to encounter her or her restaurant, Dooky Chase, by ambling along the well-beaten path of tourist destinations in New Orleans. The restaurant is less than two miles from the heart of the French Quarter, but in a neighborhood where New Orleanians live, not where visitors tend to explore. Why is she so important to this city? Leah Chase cooks New Orleans food, supports New Orleans causes, and exemplifies New Orleans values. She is like a grandmother to the whole city. At 76-years-old, if Dooky Chase is not the oldest black restaurant in New Orleans, it’s close. 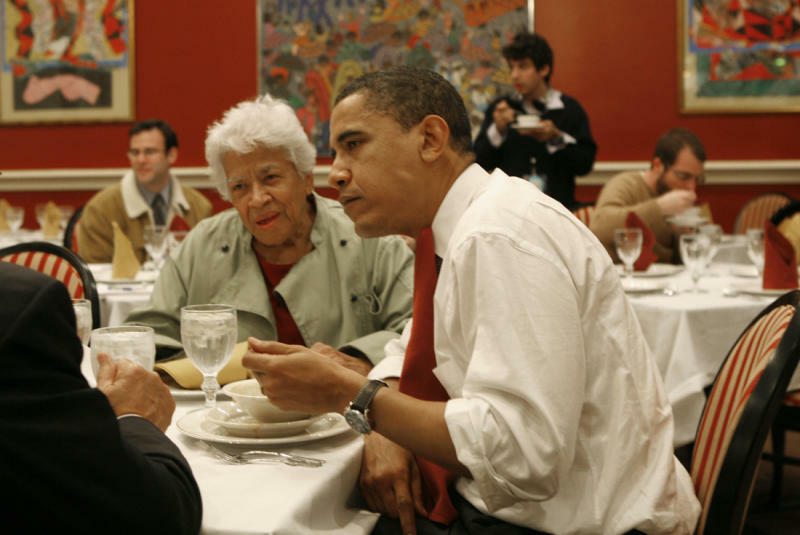 For more than 70 of those years, Leah Chase has been at the helm of that kitchen, where she serves a very personal combination of typical Southern food (fried chicken, greens, fried catfish), Creole specialties (red beans, shrimp Creole, redfish court bouillon), and her own brand of fare (butter fried quail with grits, stewed turtle, leg of lamb with okra). The Chase family already owned a small restaurant when Leah married Edgar “Dooky” Chase in 1945. The family place, named after Leah's father-in-law, the first Dooky, sold sandwiches and such, nothing fancy. But Leah had higher ambitions. She wanted to create a quality restaurant for black people to rival some of the whites-only places she had worked at in the French Quarter. So she began adding things to the menu. Such digressions from the tried-and-true didn’t endear her to her mother-in-law. 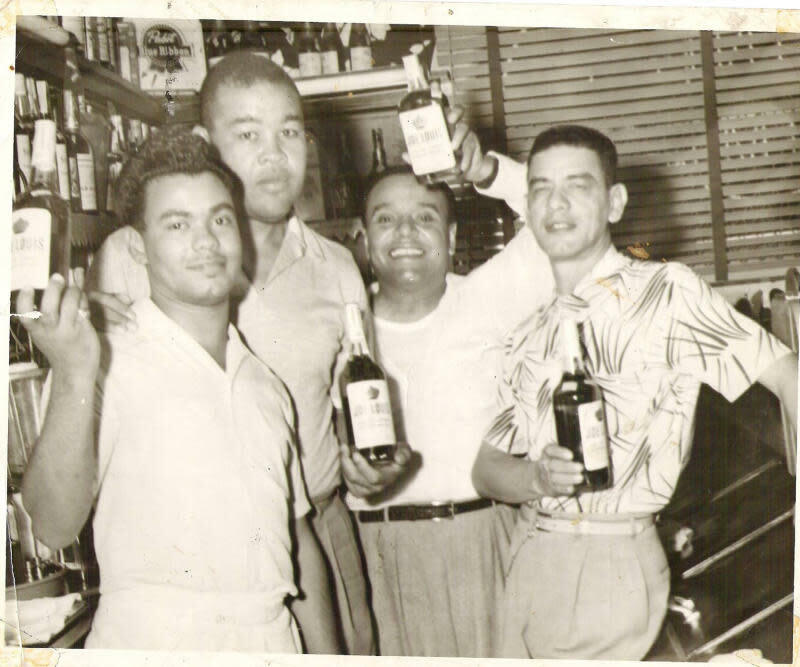 But eventually, Dooky Chase became the go-to restaurant for downtown black New Orleans, whether it was to celebrate a Little League Championship, or graduation from law school. It was the black community’s white-table-cloth establishment: Its prices were an affordable splurge for working families, and its menu contained fancy offerings like steaks and chops that most folks didn't regularly get at home. Black entertainers like Lionel Hampton, Cicely Tyson, Lena Horne, Ray Charles, and Duke Ellington made a stop at Dooky Chase de rigueur when they played New Orleans, so much so that Ray Charles included an allusion to the eatery in his version of “Early in the Morning.” It wasn’t long before white folks found out about the magic emanating from those pots. Despite the official “no race mixing” policy of the times, integrated groups would sometimes gather in one of the restaurant’s private dining rooms, especially during the Civil Rights movement. That mix of food and politics continues to this day. Because Dooky Chase is so emblematic of New Orleans, it is an essential stop for national politicians when they stomp in the Crescent City, beckoning figures like Barack Obama and George W. Bush to eat hot bowls of gumbo. But Leah's true calling is to serve her community, not pose for pictures. For decades that included the residents of the public-housing development across the street, a complex that has been redeveloped into a mixed income community called Faubourg Lafitte. “Those people worked with me, they helped me. They were good, old people. Some of them had problems, but they always looked after me and I’ll never forget them,” says Chase. Leah’s civic engagement, however, is most visible though the art collection on the walls and her service as a member of the Board of Trustees for the New Orleans Museum of Art. When the city’s levees failed during Hurricane Katrina and the restaurants flooded, there were two questions on every one’s mind: Are Mr. and Mrs. Chase okay? Were they able to save the art collection? The answer to the both questions was yes, fortunately. When Chef Leah starts talking, you are free to ask whatever questions you want, and she is free to answer however she wants. Best to just go along for the ride. It’s guaranteed to take you somewhere interesting. "In those days they fasted for 40 days, and you could not eat—you had to fast—when they told you you couldn’t have this, you couldn’t have that. But Holy Thursday was the day of the last supper. You ground those greens up, and you put all kinds of meat in there—no seafood—and that was your big dinner before Easter Sunday. Because on Friday, they wouldn’t hardly want you to eat a piece of bread. "There was another grass that we ate, Lolis, that was the funniest thing—it’s called purslane. It used to grow all around in Madisonville. When the crops were low and daddy didn’t have greens, my mother would send us to pick this grass. And she said don’t let anybody see us being so poor, we’re eating this grass, you know? She would cook that like spinach. I go to California, [to a restaurant run by these] these two young women chefs out there, I order my liver—$20 for a piece of liver!—and then I look on the plate: purslane! Yeah I paid $20 for this purslane. Now you gotta be rich to eat the grass!" "Daube was a thing that we always made. We took a piece of round meat, and we’d put it in the pot with flour, salt, pepper, and brown it on all sides. Let it steam in that pot with some tomatoes. If you have Creole tomatoes, all the better. Put tomatoes around and serve that on spaghetti—the best thing in the world. So I’m trying to get that on the menu again, because that is what we came up with." "I started working for this lady; she really taught me. She had a restaurant 'bout as big as this room here. She served breakfast, lunch, and dinner. So the woman was getting old and she wanted to downsize, so that’s when we opened the Coffee Pot. It was across the street from where you see it is now. All she used to serve was breakfast and hamburgers. So you know, Lolis, this is who ran that restaurant: Estelle was 16-years-old; I was 18, Lucy was 19. Three girls. You hear me? We were running that woman’s restaurant. You couldn’t get three 19-year-olds to do that today if you tried. We ran those restaurants, we prepared the food. We served. We cleaned up. We took the money to the bank! So we told her we wanted to do something different. She said okay, if y’all think y’all can make it work, you can do a hot lunch. Now, we don’t know nothing about nothing. So Lucy say, 'Well what about some Creole wieners?' 'Oh, I say, yeah that’s good.' That’s what we have at our house—Creole wieners and spaghetti. You just make a good tomato gravy and cut the wieners up in it. That’s it. People in those days knew how to work with whatever they had. If you didn’t have anything, you might just have what we call potato stew. Just put the red gravy and the potatoes in the stew—that’s all you had to eat with some rice." "My daddy raised okra and we had okra coming through the wazoo. Nothing like crowder peas when you put those okra around it. [With] lamb, put the garlic in it, and drop those okra around that lamb—unbelievable. What a flavor it gives—[and] something that gives a thickness. I take that boneless leg of lamb, and I’m gonna put plenty garlic in it. Then I’m gonna rub it and roast it. Then, when it just gets cooked, I put onions and all that around it. In that sauce that’s cooking, you can tighten the gravy up with a little roux flour if you want. But just drop those okra on there. Unbelievable. I do a lot of things with okra. I do the beef brisket, I stuff that with crawfish, then I put the whole okra around it. That okra is what makes it different. That whole okra will do so much for it, it really does." "I like the turtle soup at Galatoire’s. They do a good job there. Even though I wouldn’t make a turtle soup like that, 'cause I don’t know where they get the turtle meat from. I gotta have that turtle crawling. If I don’t see that turtle crawling, you can’t sell it to me. I don’t want it. I got to see it crawling. I’m gonna take that turtle home, with the head on, live, and then I know how to take that head off. I know how to clean that turtle. That’s what you call cowan. You always feel about the legs of a turtle; you always want to get a female with some eggs in it. But you cannot cook that turtle unless you have fresh thyme. Turtle can’t work without fresh thyme." Read more "10 Dishes" interviews.